During the first year, a piano should be tuned and regulated more often as the strings stretch and the action felt "settles in". Three or four tunings in the first year and one complete regulation after one year is usually adequate. The soundboard of a piano expands and contracts during the year as the wood absorbs and releases moisture from and into the surrounding air. Because the strings are stretched across the bridge of the soundboard, any movement of the soundboard from humidity changes invariably causes the piano to go out of tune. This happens whether the piano is played or not and is probably the most influential factor on tuning for the average family piano. Pianos kept in humidity-controlled rooms last longer and require less tunings than other pianos. The less expansion and contraction the wood in a piano has to endure, the better. A piano that is used frequently and intensely (for instance, a recording studio piano) will go out of tune more quickly than one that is lightly used. Because of the friction produced by the bridge and rail, different tensions may exist between the speaking and non-speaking segments of the strings. When a note is played very loudly, the force of the hammer may cause the strings to momentarily unseat from the bridge and rail, and if there is any difference in tension between the speaking and non-speaking segments at the time, it will equalize, causing the note to go out of tune. A skilled piano tuner will optimize the tension differential along each string he tunes by utilizing a special tuning technique called "setting" the string. Doing this enables the piano to stay in tune longer. However, any movement of the soundboard from humidity changes (see above) will immediately cause the string to go out of tune, as well as nullify the piano tuner's string-setting efforts, making the string "ready" to go out of tune even more when it is played loudly. 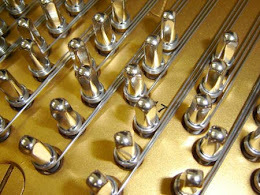 If the piano is old, the tuning pins may be so loose that they slip whenever the piano is played. The result is a piano that sounds about as musical as a choir of elephants, no matter how hard the piano tuner struggles to keep this from happening. The easiest fix for this is to inject pinblock restoring fluid around the tuning pins. 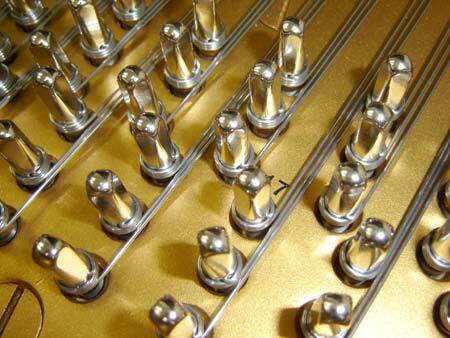 The best repair for fine pianos, however, is to re-string the piano with larger tuning pins or replace the pinblock. Contrary to popular belief, most higher-quality grand pianos are sturdy enough to hold their tuning through the physical stresses of moving. It is the insidious humidity change from the old location to the new location that really causes the piano to go out of tune. For this reason, it is recommended to let a piano acclimatize to its new location for 3-4 weeks, then have it tuned. Then helper-guy chimes in with the inevitable: "Uh-oh." Of course, some "physical stresses" are just too much for even the best pianos. 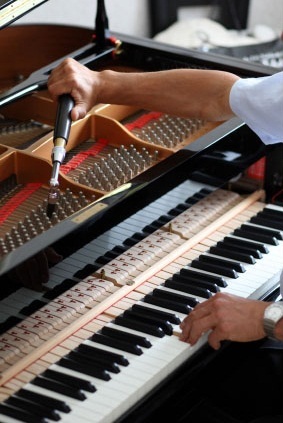 So, how often should you get your piano tuned? Assuming the piano is passed its first year of service and the tuning pins are tight, it depends on: (A) How sensitive your ears are to an out-of-tune piano, (B) The humidity stability of the surrounding environment, (C) How your piano responds to humidity changes, and (D) How much the piano is used. Typical tuning schedules range from one to four times per year. Most piano manufacturers recommend two tunings per year. Because of humidity-induced soundboard movement, the pitch of a piano follows a curve like the one shown on the left. When the heater comes on in the fall, it dramatically lowers the humidity inside the house, causing the piano to go flat. Since air dries out more when it is heated more, the colder it is outdoors, the drier it will be indoors where the piano is. When the heater is turned off in the spring, the indoor humidity will rise again, and the piano will go sharp. This slight change in pitch wouldn't be so bad if it took place evenly over all 88 notes; the problem is that it doesn't. On most pianos the middle of the keyboard (the low to mid treble section) is affected the most by seasonal soundboard movement. This unequal movement of the soundboard makes the octaves sound out of tune. Furthermore, if the piano is played very loudly after soundboard movement has taken place, certain individual notes may go out of tune (see Intense Playing above). The best times to tune a piano with a twice-a-year schedule are one month after the heater is turned on in the fall and one month after the heater is turned off in the spring (usually around June and December), because this gives the maximum amount of "in-tune" time between tunings. 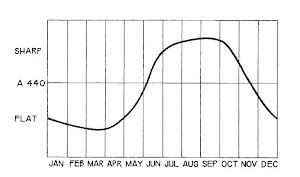 However, as you can see from the graph, this means that more pitch adjustment will be necessary at each tuning, possibly producing less stable tunings. The solution, of course, is to tune the piano more often, but this is not always a financial option. 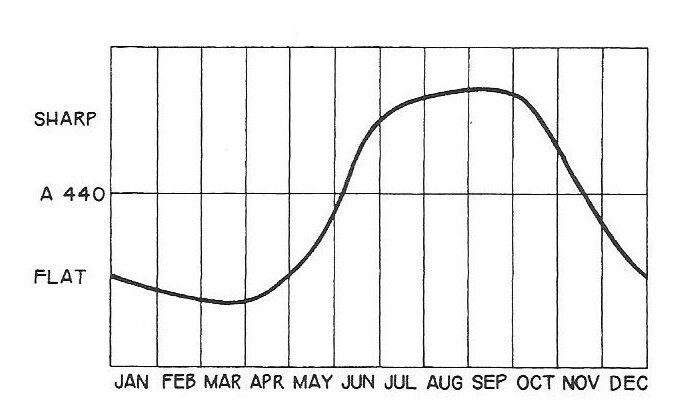 Having a humidity control system installed in the piano or controlling the humidity of the entire room has the effect of diminishing the maximum amplitude of the curve shown on the graph. In other words, the piano does not go as sharp or flat during the summer and winter months as it would without the system. In many cases the system will enable the piano to go a whole year without needing tuning, but this depends on your ears. In any case, humidity control systems can only improve tuning stability. If you only want your piano tuned once per year, you should have it done at the same time each year, preferably in late May or November. If you are the type who can't tell when your piano is out of tune, and you are wondering WHY it even needs to be tuned at all, I would suggest having someone who can tell come and play your piano -- it may be more out of tune than you think. Most pianos will sound out of tune after one year. If you want to improve your sense of what in-tune pianos sound like, you could attend a piano concert or visit a friend who always keeps his piano in tune. If you like not being able to tell that your piano is out of tune, then (chuckle, chuckle) I can't help you there . . . .
Take care of your piano by not neglecting it for extended periods of time. Piano strings stretch over time, and if left untuned for long enough, a piano will require a major pitch raising when it is tuned again. A major pitch raising is not good for the health of your piano; it increases the possibility of breaking some strings and/or may introduce a permanent out-of-tune sound known as "false beating." Let all of this be an encouragement to play your piano and enjoy it at its full potential. Your piano should always sound at its best. If you are interested in learning how to tune your piano yourself, I would be glad to show you some pointers on setting strings and pins, listening for beats, and whatnot. You should also google "how not to tune a piano." Just please, don't be that guy in the video . . . .